Whatever your opinion of 2016 has been, one thing's for sure: the culinary scene has certainly outdone itself this year. We never ran out of new restaurants to try, with a handful of top foreign ones opening up in the past 12 months and several food parks stepping up their game. It was a year of good food, but we also noticed some pretty questionable dishes on the menus this year. We list some of them here, throwing in a brief fearless forecast for the 2017 foodie scene while we're at it. Check it out! These implant-looking things, described as delicate, refreshing raindrops for your tastebuds, were hailed abroad for their simplicity and purity. However, lots of foodies were let down when it landed in the Philippines, with the popular verdict being "parang gulamang matabang." Egg waffles have long been a must-eat in nearby Hong Kong, but it reached peak level here in the Philippines this year (we're blaming Stranger Things). It has shown up as a standalone snack or as a custard-filled treat, but its ice cream cone iteration was definitely its claim to fame. First came the cronut. Then came the ramen burger and the chizza. This year, it's the sushirrito, the inevitable love child of a sushi roll and a burrito. It's actually pretty brilliant, and we couldn't help but ask: why didn't anyone think of this earlier? Bailey's? Candied bacon? Ketchup and mayo? Beer and chicharon? Name your craving and you can probably scoop up a frozen treat inspired by it somewhere in the country. No doubt about it, 2016 was definitely a banner year for ice cream enthusiasts. A regular milkshake served in a tall glass just won't do anymore for today's Instagrammers: these days, a milkshake has to have ice cream, cotton candy, chocolate, cookies, popcorn, or even an entire slice of cake perched upon it. It's picture-perfect, all right, but how the heck are you supposed to eat it all, really? 2016 saw our obsession with cheese reach new heights. Extra cheesy pizza? All the pizza stores have it. Cheese with liempo? Kartilya's done it. Cheese tarts? Hello, Pablo, Lava, and Kumori! It's gotten so crazy, people have actually started scraping melted raclette cheese on top of anything they can get their hands on. Sobrang cheesy, pare! If you want to be truly uso, your regular macchiato won't make the cut anymore. These days, it's all about a cold brew, which involves letting ground coffee steep in room temperature water for an extended period of time to bring out its natural flavor. Even Starbucks has joined the bandwagon! 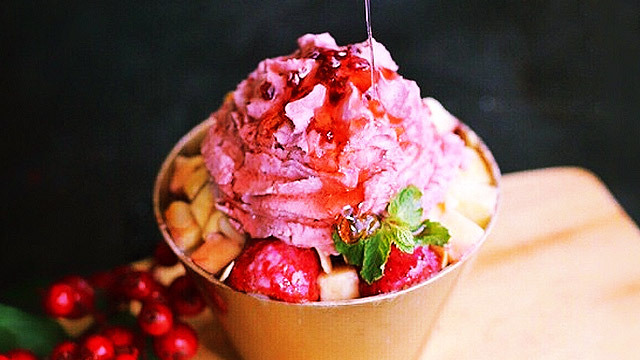 With finely shaved ice and a slew of toppings ranging from fresh fruit to ice cream, the bingsu can be considered as the halo-halo's Korean counterpart. Given the soaring temperatures we saw over the past months, it's not surprising that this treat became a top fave. Matcha has long been a go-to for people seeking a more unique flavor, but with the way 2016 practically rammed green tea everything down our throats, it's no longer the hipster delight we came to know and love. From matcha pancakes to matcha lava cakes to matcha drinks to matcha cookies, there's just no escaping this particular green monster. Remember how you thought rainbow-colored tasty bread was the bomb when you were a kid? Well, you can relive your childhood memories right now via the many multi-hued food you can munch on in the PH, from rainbow cake to rainbow latte to rainbow xiao long bao. These Hawaiian seafood bowls are healthy and yummy, with fresh raw fish, white rice, and a sizeable dose of veggies and other add-ons. A few poke places have already opened in 2016, and we're pretty sure we'll be seeing more of them in the coming months! Burger King Japan's black burgers created quite the stir when it was launched back in 2014, and we're willing to bet that it's only a matter of time before an entrepreneurial soul copies the idea here in the PH. Pinoys are adopting a more sosyal approach to street food, as demonstrated by the rise of more sterile street food joints and hawker-style food courts around Metro Manila. We don't know about you, but we still think it's more fun to make tusok-tusok the fish ball while breathing in the smog of the city! People abroad are digging kombucha, a fermented tea with a colony of special bacteria and yeast. We know it sounds (and looks) gross, but don't knock it off just yet: the finished product supposedly tastes pretty good, and is chock-full of vitamins and minerals. And given its popularity, you can probably taste it for yourself very soon! You read that right: Our very own lutong bahay might just be the star of the global culinary scene in 2017, thanks in part to the popularity of Filipino restaurants abroad and the aggressive expansion of Jollibee overseas. Astig, diba?